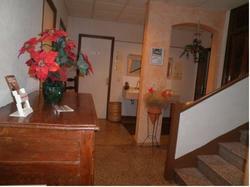 Located in the centre of the Castellane Village, this hotel is 100 meters from the Verdon River and Gorges. Canoeing, rafting and hiking are some of the activities that can be done in the surrounding area. With a village or mountains view, each room at Hôtel du Roc is equipped with an LCD TV and a bathroom with shower, toilet and free toiletries. A continental breakfast is served daily and a traditional restaurant is also at your disposal on site. Saint Andrée les Alpes Train Station is 25 km away and Moustiers Sainte Marie is 45 km away. This room is provided with free Wi-Fi, LCD TV and bathroom.